Absent flashy, headline-grabbing new features, Adobe's updates for Flash Professional CC are simply improvements to the program's existing core features and functions. Alongside the app's enhanced user interface, Flash CC's new ability to export projects to HTML, to full HD video and audio, and to test animations directly via USB on mobile devices, are designed to benefit the vast majority of users. Need more space to work on your animation? 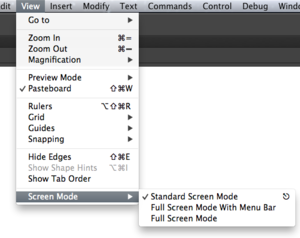 Use Flash CC's full screen editing mode. 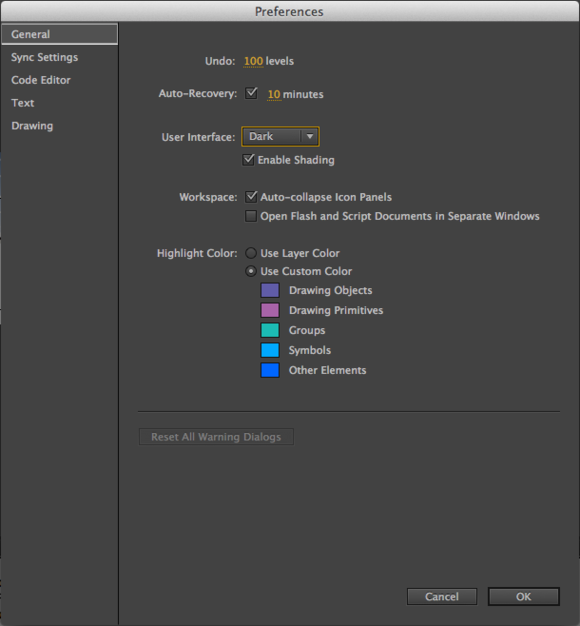 Adobe has overhauled the familiar Flash user interface in this version. It is now a fashionable dark gray, which looks very professional (but can be switched back to light gray). The timeline and code editor have also been improved, alongside numerous other interface elements. A full screen editing mode, which shows only the canvas, hiding all the palettes, is a great addition. The workspace canvas has also been adjusted. In the past, you were limited to a maximum size. That limitation is now gone, so you can import large graphics for a scrolling background—great for game developers creating a jump-n-run (side scroller) game. Flash's new 64-bit architecture works well with late model MacBook laptops and will surely scream with the recently introduced Mac Pros. 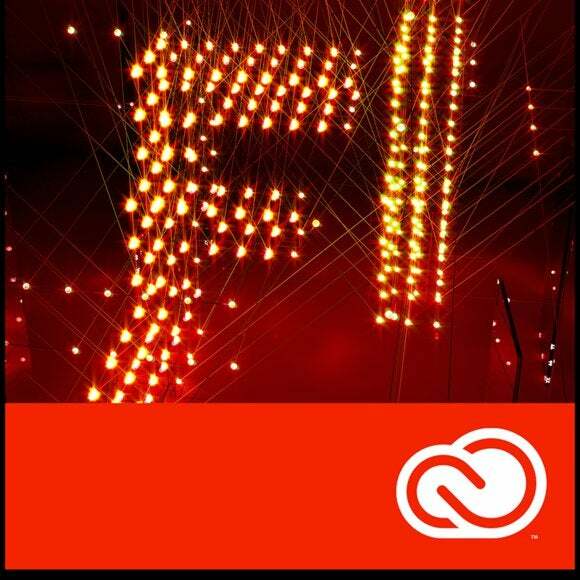 Adobe has rewritten most of Flash's code to convert it to a native cocoa application. For artists who like to work anywhere from a client's workspace to their home office, Flash CC automatically syncs preferences of your Flash installations through the Creative Cloud. Dark grey or bright grey: You can decide which color theme works best for you. 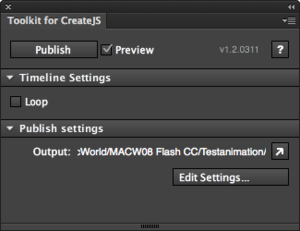 Flash Professional CC's ability to export video and HTML are the most intriguing and important features of this upgrade. That's because, with the growing mobile and tablet market, many companies are migrating the front end of their websites away from Flash to HTML5. At the same time, companies are installing digital signage, which works best with video, so for some users, the new version of Flash might have multiple uses. Exporting a Flash Animation as Video (.mov file) is straightforward, and while this feature was available in CS6, Adobe Media Encoder is now integrated into the workflow, allowing conversion to different formats. In combination with the new unlimited workspace, it is now possible to create videos with an almost endless scrolling background. Exporting animations as HTML5 is a step in the right direction, but that feature might not be useful for everyone. I would also like to generate videos in an SWF file through ActionScript. You know those viral marketing campaigns that allow you to add yourself to a video and share it with your friends? Adding the ability to export a video from within an SWF would allow you to create such an application. It would also allow you to record video in a Flash App that requires interaction. Adobe has put a lot of effort into supporting mobile developers. 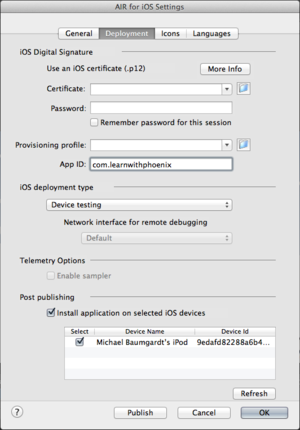 In the previous Flash version you had to go through Apple iTunes to upload your app; now you simply connect your mobile device and set the target to Air for iOS or Air for Android. This little improvement is a huge timesaver. Testing your mobile app just got easier: Publish directly to your iPhone for testing without having to go through iTunes. While there's much to praise in the new version of Flash, there are some missing items. For example, the Bone Tool (Inverse Kinematic), one of my favorite new features in CS4, has been removed from the program. According to Adobe, the Bone Tool had several bugs that led to user complaints. It was dropped from Flash Professional CC, though it will likely be reinstated at a later point with an improved workflow. 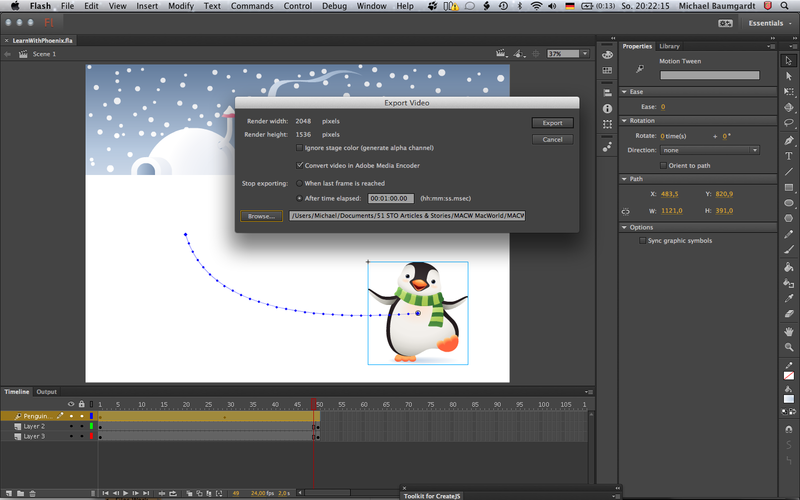 Adobe Flash Professional CC looks fresh with its new and improved interface. With updated support for HTML and Video Export, the new version of Flash seems to move in a new direction as an all-in-one video/animation tool. New features work mostly as expected, though with room for improvement. The question now is: Who is the target audience? Movie editors will certainly stay with After Effects or Premiere Pro and Web Developers have likely set their sights on Adobe Edge Animate. Where does Flash Professional CC fit in? Flash still has the great advantage of being a solid developer platform equipped with a powerful programming language (ActionScript 3.0). If Adobe pushes Flash further toward game-and mobil-development, it will find a new user base. For such users, the new features are nice to have, but not as fundamental as the sprite sheet generator introduced in CS6. For most users, this update might not offer enough to justify an upgrade. Those who are planning to buy a new Mac Pro later this year, the performance boost of 64-bit however might be tempting.